BRYAN EATON/Staff photo. Newburyport police officer Megan Tierney fingerprints Saskia Howe, 5, as her kindergarten classmates wait their turn. 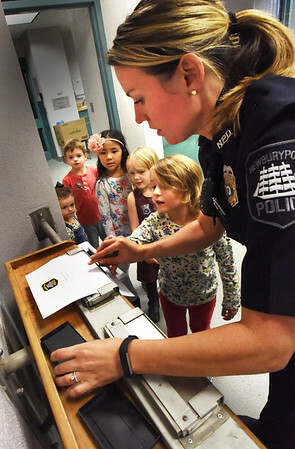 The Newburyport Montessori School students were touring the police station part of their learning about local institutions like the fire department, banks and library.